I love sneaking healthy veggie-packed meals into my family's dinner rotation as often as I can. Making the meal extremely flavorful and adding a few ingredients that they already like really helps make that task a lot easier. Not that they complain--both Chris and Bradley eat pretty much everything I give them. But it definitely helps when the healthy meal tastes like it isn't a healthy meal. 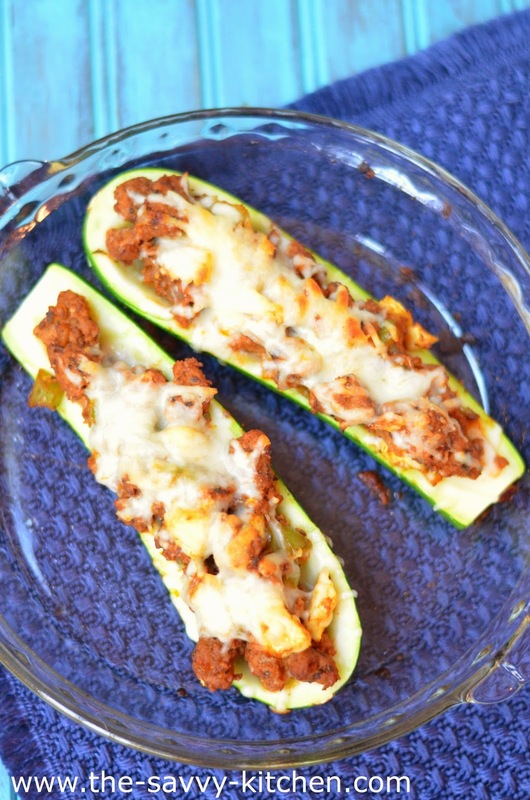 These zucchini boats are filled with an Italian-style filling. I used turkey as my protein and mixed it with onions, green peppers and extra zucchini (veggies, veggies, veggies! ), and the sauce is a basic tomato sauce. 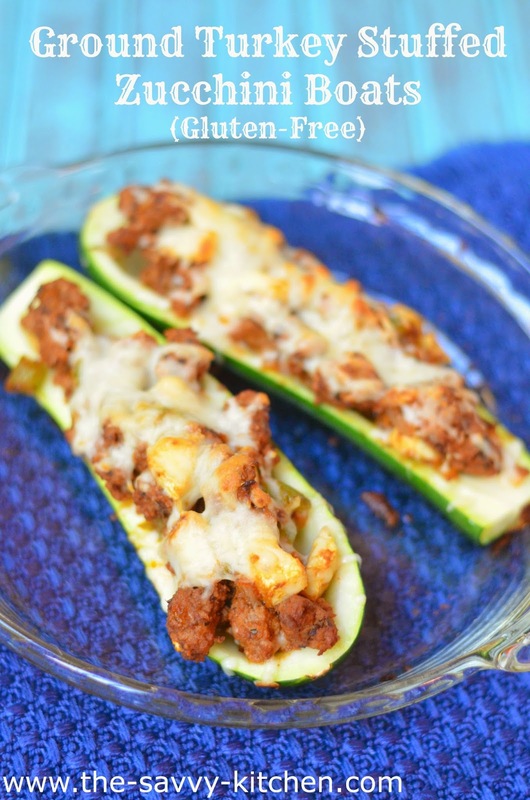 Topping them with a little cheese just makes them even more appealing and flavorful. You also get your meat/protein and veggies all in one dish, so there's no need to make any extra sides. Enjoy! In a large skillet, brown turkey over medium-high heat. Meanwhile, cut off the end of each zucchini. Then cut each one in half lengthwise. Scoop out the center, leaving a 1/4" border. Chop 1/2 cup of the zucchini meat and set aside. Once turkey is cooked, add onion, green pepper, 1/2 cup chopped zucchini meat and tomato sauce. Simmer for 5 minutes. 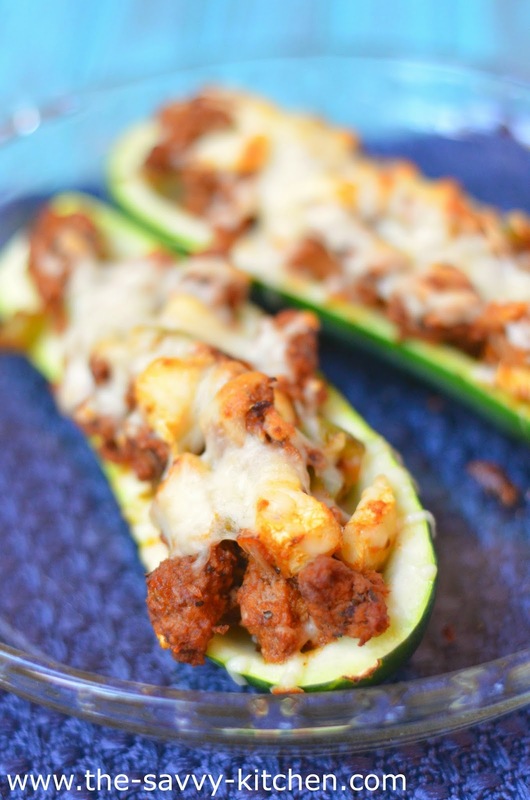 Split turkey mixture evenly among the four zucchini boats and place in prepared baking dish. Spray aluminum foil with cooking spray and cover zucchini boats. Cook for 30 minutes. During the last 5 minutes, remove cover and sprinkle cheese on top. Once cheese is melted, remove from oven and serve immediately.